An api monitor tool which can automatic tracing all apis input and output parameters. this application will auto trace the target program and monitor the input and output of function call. The software can help us to analysis program errors, process inside the target program. Unlike others apispy or api monitor tools, the software did not need to develop any dll or hook dll. Functions A Best API Monitor tool. 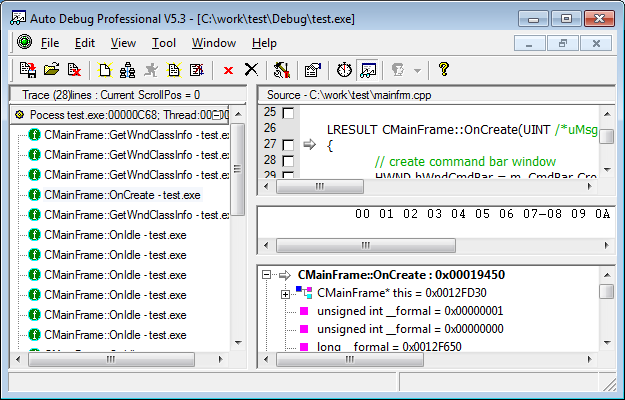 Using VBScript or JScript to control Auto Debug. Source Code Level Monitor. Automatic analysis parameter type with pdb files. Very easy generate pdb files without source code if you know the api prototype. Supporting tracing COM and activex Interface. Supporting monitor multi-thread. Supporting spying the parameters of function before and after the function is called. Supporting the function that the target program will dump CallStack when exception occurs. Supporting Plug-in technology. The user can customize input format and output format. Not need to know the prototype of the functions. All the API functions, including the opened functions that are called inside the DLL, can be monitored in deed. This site does not contain serial number, crack, keygen Auto Debug Professional serial number : serial number is the simplest type of crack. A serial number(cdkey,product key,etc) is register the program as you may already know. a crack or keygen may contain harmful software. If you cannot find the exact version you want, just give it a try. for more information read .nfo/.txt/.diz file include in zipped file.